One video game genre that is quite popular in the indie game scene is the roguelike/rogue-lite genre. For those of you not familiar with the genre these are games where death truly matters. In roguelike games you lose everything when you die and in rogue-lite games you suffer a penalty each time you die. I have to admit that I have never been a big fan of this genre due to the fact that I don’t like the idea of losing all of my progress each time I die. When I saw Moonlighter though I was intrigued because the premise of exploring dungeons at night to find items to sell in your shop during the day was a really interesting concept. Moonlighter finds a way to combine a rogue-lite dungeon crawler with a shopkeeper simulator to create a truly engaging experience that you won’t want to put down. We at Geeky Hobbies would like to thank Digital Sun and 11 bit studios for the review copy of Moonlighter used for this review. Other than receiving a free copy of the game to review, we at Geeky Hobbies received no other compensation for this review. 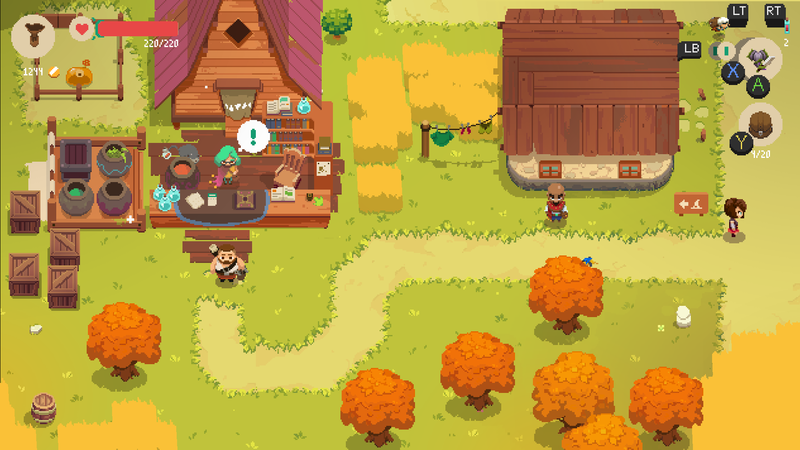 In Moonlighter you play as Will who is a resident of the town of Rynoka. Rynoka is a town that formed a long time ago when a group of portals suddenly emerged outside of town that took adventurers to different realms and dimensions. As word of the portals spread Rynoka grew as adventurers flooded to the town to explore the dungeons and shopkeepers came to sell the goods found in the dungeon. In recent years though the town has suffered as adventurers and shopkeepers have left the town after abandoning the dungeons. Will has always wanted to be an adventurer but has been stuck running his family’s shop. One day he decides that he wants more out of his life so he decides to run his shop during the day and adventure into the dungeons at night. With a mysterious fifth dungeon looming that no one has ever explored, Will is determined to discover the mystery behind the portals. In the most basic terms I would describe Moonlighter as a rogue-lite dungeon crawling shop keeper game. That is quite a mouthful isn’t it? Basically you take control of the life of Will as he runs his shop during the day and explores the dungeons during the night. While exploring the dungeon you will encounter loot which you can then turn around and sell in your shop in order to make money. You can then use this money to expand your shop and improve your equipment. To further explain each part of the game I will break down each section of the game one at a time. As you will be spending more of your time with the rogue-lite/dungeon crawling mechanics, lets start there. Basically this part of the game plays like most of these type of rogue-lite type games. You can equip a couple different types of weapons (most are melee weapons) which give you access to different types of attacks. The game uses one button for your main attack and one button for a secondary ability which is dependent on weapon you have equipped. There is also a button dedicated to dodging, a button that lets you use equipped potions, a button that changes between your two equipped weapons, and a button that lets you quickly leave the dungeon (for a cost). While I have never been a huge fan of the rogue-lite genre, I have to say that I enjoyed the combat more than I was expecting. For the most part the controls are responsive where it is usually your fault when you take damage. As the game doesn’t have a lot of different types of attacks, the combat relies more on timing and dodging enemy attacks. Most of the skill in the combat comes from aiming your attacks correctly and avoiding the enemies attacks. The combat may be simpler than other games but I thought is was quite fun. As Moonlighter is a rogue-lite game, a lot of people are probably interested in how the rogue-lite mechanics factor into the game. When you are ready to enter the dungeons you choose one of the unlocked dungeon types you would like to enter. You start the game with one dungeon open and after you beat a dungeon the next dungeon is opened up for you. Entering the portal teleports you to a randomly generated dungeon of the type you chose. Each dungeon features a number of floors (the first two dungeons consist of three floors and a boss room). You explore room by room until you find the room that has the portal that takes you to the next floor. When you reach the last floor you will face the dungeon’s boss which you fight to clear the dungeon and unlock the next dungeon. If you die at any point in the dungeon you lose all of the items stored in your backup and you restart the dungeon from the beginning. Not being a big fan of losing progress, I think this punishment is fair as it is a pretty big punishment for dying but at the same time you don’t feel like you lost a lot of progress when you die. As a self prescribed hoarder in video games at first I didn’t love Moonlighter’s inventory system. Basically you are given a set of spaces where you can store items. All items take up only one space and most items can be stacked up to a certain amount. When I first started playing Moonlighter the biggest problem I had with the inventory system is that you don’t get as many spaces in your bag as you would like. Being a hoarder I wished you could store more items in your bag so you had more to sell the next morning. While I think the game could have still given you a little more room, after you play the game for a while you understand that in the context of the game it makes sense that the game forces you to pick and choose which items you keep in your bag. You have to determine which items you need to keep for crafting and which are the most valuable to sell. The rest of the items you either have to leave in the dungeon or you can use an item that you are given that automatically sells the item for a fraction of its value. Being a hoarder it originally pained me to abandon these items/sell them for cheap but as I continued to play the game I started to see what the game was trying to do with the limited bag size. While combat is obviously the most important mechanic in the adventure portion of the game, inventory management becomes pretty important as well. While running your shop you will eventually start learning the prices of the various items but for the items that you have never sold you have to estimate their value on the fly. The more interesting thing that comes out of the inventory management mechanic though is the idea that some of the items have “curses” on them. Some of these curses include limits on where the items can be placed in your bag, items that break if you are hit too many times, items that will destroy other items in your bag when you return to town, and some items that you won’t even know what they are until you return to town. The most interesting “curse” though is one that turns one of the neighboring item(s) into the same item as the cursed item. If you utilize these curses well they can be quite valuable as I used them to create a lot of pretty valuable items early in the game. I really liked the curse mechanic as it kind of adds a puzzle mechanic to the inventory management system which I really enjoyed. Now that I have talked about the inventory management, lets discuss what you do with the items once you return to town. To start the game you have a shop that has four shelf spaces where you can place items to sell. As you earn more money you can upgrade your shop which allows you to sell more items at a time. You choose which items you want to put out for sale and then put a price on the items. When you first put up an item for sale you are not given a price range for the item so you need to estimate the item’s price. When you open your shop customers will come in and browse the items you have for sale. If they like the price that you have put on an item they will head to the cash register and you check them out to get the money for the item. Most of the gameplay in the shopkeeping portion of the game comes from figuring out the proper price for the items. All of the items in the game have four different price ranges. On the two extremes are charging too much or too little. Charging too much will lose you a sale while charging too little will lead to you losing potential revenue. If you charge a little too much the customers may still purchase the item but they won’t be as satisfied with their purchase. The sweet spot is finding the price range where customers will pay a fair price and still be happy with their purchase. After playing the game for a while you can start to get an idea of what you should charge for an item but this process mostly relies on a lot of trial and error. Start low or high and adjust your prices based on your customers reactions. This might not sound that interesting to some people but I actually found it to be quite fun. You can keep the store open until nighttime which allows you to add more items to your shelves after other items have sold. Basically your typical day as a shopkeeper involves updating prices, adding new items for sale, and checking out customers. Occasionally you will also have to deal with thieves who will try to steal from your shop. As these customers look different than the other customers you can keep an eye on them. When they steal an item they will start to head to the door. You have to tackle them before they make it to the door in order to prevent them from stealing the item. I found the thieves to be a nice distraction from time to time. Based on my experience though the thieves aren’t always that intelligent. One day I had a thief come into the store multiple times and he failed several times trying to steal the least valuable item that I had for sale. While this is kind of a minor issue, I think the biggest problem that I had with Moonlighter was the fact that the game does nothing to distinguish between items whose sole purpose is to be sold and items that actually have another purpose. While it might have hurt the game’s theme to be told which items are worthless and which aren’t, it would have been nice for people that refuse to sell something because they think that they might eventually need it. The game should have either indicated in the item’s text or used some sort of symbol that made it clear which items can be used for other purposes and which items are just meant to be sold. Another small issue I had with Moonlighter is that the game basically forces you to learn some things on your own. The game gives you a brief tutorial on the most basic mechanics and then expects you to learn the rest of the mechanics by yourself. This is not that big of deal as the mechanics are pretty self explanatory but I think the game could have added a little more guidance to the early game. This is far from a big deal though as it just forces you to spend a little more time figuring out how some of the mechanics work. On the atmosphere front, Moonlighter also does a really good job. The graphical style is reminiscent of the SNES era of games and is really well done in my opinion. The audio/music is also well done. While the game’s story is given out in small bits and pieces from what I have seen so far it is actually really interesting. I am far from from the end but Moonlighter is teasing a story that the dungeons are not exactly what they appear to be which has me intrigued. The graphics, audio and story work well together to create an engaging atmosphere where I want to see what happens next in the world of Rynoka. As far as length I would say that it is probably going to depend significantly on the type of player that you are. The length of the game is mostly going to come down to how cautious you are and how good you are at these type of games. Players who are cautious and slowly progress through the dungeons while building up their shop and town are going to take a lot more time in the game than someone that goes headfirst into a fight. Being more of a cautious player I would say that it took me around 4-5 hours to beat the first dungeon (there are five dungeons in the game). I was pretty methodical in the game though as I didn’t want to ditch valuable items in the dungeon. Your skill in the game is also going to make a difference as a player who is really good at these type of rogue-lite games won’t need to purchase as many upgrades which means they can beat the dungeon bosses quicker. For players that rush through the game as quickly as possible you may be able to beat the game in around 15 hours but if you take your time I could easily see you spending 40+ hours in the game. If you enjoy the shopkeeping and dungeon crawling mechanics I could actually see you getting an almost infinite amount of time out of the game just like Stardew Valley. If you ever wanted to play a game that combined rogue-lite dungeon crawling with the ability to run your own shop, I think you will really enjoy Moonlighter. The combat might not be as complicated as other games but it works well for the game as it is fun and engaging. The shopkeeping aspect of the game involves a lot of trial and error but there is just something really compelling about running your own shop. The whole idea of exploring the dungeons to get items that you then sell is surprisingly addicting. Moonlighter is the type of game that is going to be hard to put down when you get into a groove. If you don’t like rogue-lite games or don’t really care for the idea of running your own shop, Moonlighter probably won’t be for you. In all other cases though I would highly recommend that you check out Moonlighter. The combat is accessible, responsive and most importantly fun. It is surprisingly addicting running your own shop. The game could have done a better job indicating which items had a purpose outside of being sold. People who love hoarding items will dislike how few items you can hold at a time.